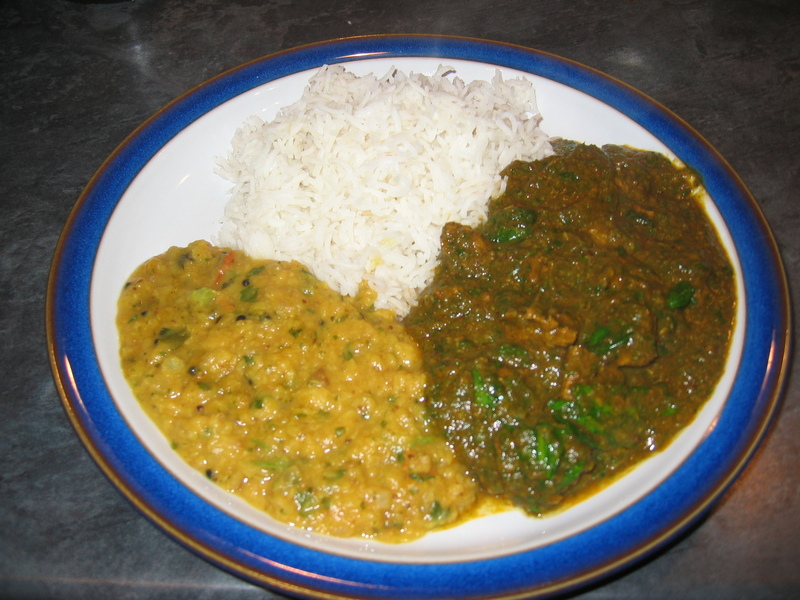 Continuing the Spinach Curry theme, I came across some great lamb steaks in the supermarket at the weekend and decided that I’d try a Lamb curry for a change. This is quite an interesting recipe – I believe it evolved from one used on a Bradford Curry house which I once frequented, and effectivey casseroles the meat over time rather than sealing in a tarka mixture first and cooking quickly. This recipe would probably benefit from using a poorer quality of meat cooked slowly over a longer period of time. Nevertheless, this is a great lamb curry recipe and very different from the Chicken ones which I usually prefer. What’s more, it’s even better the following day (often the case with curries..). I cooked this with half the quantity of Green chilli to give a medium dish – this really allowed the aromatic spices in the Garam Masala to stand out. Add chilli powder and salt and stir well. Stir in the lamb and bring to the boil. Wilt 2/3 of the spinach in a separate pan with a splash of water and as much of the green chilli as you would like to use. Cover the pan – this should only take 1 minute. Again, using the hand blender, blitz the spinach mixture to form a smooth pouring paste.